We pride ourselves on quality, value and safety. We promote innovation and collaboration. 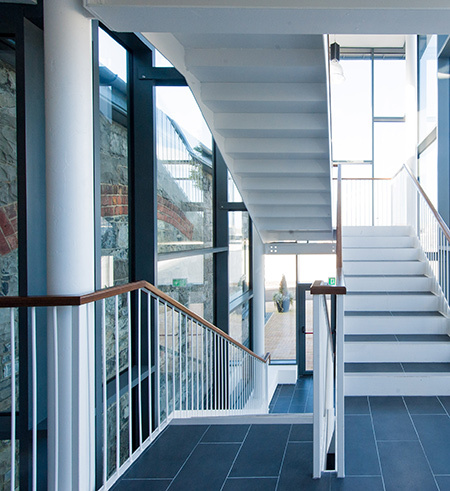 Nautic is a progressive Irish construction company providing complete construction, contract and design-build solutions for public and private commercial clients. Founded in 1981, Nautic Building Company Limited has earned a solid reputation for delivering dynamic construction solutions of the highest quality, value and efficiency. Working with a range of high-profile and progressive clients, we safely and successfully complete projects across a broad range of sectors including commercial, industrial, education, healthcare, residential, civil and conservation. Nautic places a strong emphasis on collaborative relationships in each of our projects. Partnering with the client throughout the construction process, we believe a strong working relationship with the design team’s architects, quantity surveyors and engineers is critical to the successful completion of projects. Providing solutions for public bodies and private commercial clients, we can undertake all aspects of construction for fit out, refurbishment, extension and multi-story and multi-unit development of residential and commercial buildings. We don’t just build, we provide the optimum solution. Never compromising on safety, quality or value, our processes also nurture craftmanship and tradition while meaningfully integrating the best of modern design. Placing the client’s requirements at the top of our agenda, we aim to always provide the best solution. Mindful of the client’s need to meet their expectations on site, we work to tight deadlines ensuring minimal disruption. Taking a pro-active, co-operative approach to unexpected project challenges, we strive to go above and beyond to fulfil client and design team expectations. Sustainability is of the utmost importance to Nautic. Striving for solutions that work for all project stakeholders, everything we do is sensitive to our scenic and precious environment. We are wholeheartedly committed to the continued health and safety of all our clients and workers. Nautic is compliant with ISO 9001:2015, Certified with Safe-T-Cert, CIRI Accredited, and a member of Construction Industry Federation (CIF), Master Builders and Contractors Association (MBCA) and National Irish Safety Organisation (NISO). Nautic takes great pride in working with creative clients to push design and build boundaries. “We confirm that the Health Services appointed Nautic Building Company Limited as main contractor for the enabling works contract at the Clinical Education Research Building Centre on the University Hospital Limerick Campus. The enabling works contract comprised construction of a new car park, diversion of existing below ground ESB cables, provision of surface water drainage, pedestrian links, provision of secure fencing to the existing alcohological buffer zone and relocation of prefabricated buildings. We acted as Project Manager for this development for the Health Services Executive. We found Nautic Building Company to be a very competent contractor who was professional and committed to the successful delivery of the project. They are well organised and gave particular attention to the management of the challenges encountered on a live Hospital Campus including traffic management, noise management and dust management. They were proactive, cooperative and operated in a positive manner throughout the contract. “Nautic Building Company Ltd successfully completed the enabling works for the Clinical Education and Research Centre in University Hospital Limerick, which involved the direction of existing site services and the provision of a new surface car park, including pedestrian access routes. The works were completed within the live hospital campus in Dooradoyle and required careful management of traffic, noise and dust. “I can confirm that Nautic Building Company were the main contractor on the following building projects. I was the project architect on the projects and can confidently suggest that the company was highly competent and efficient in the completion of these works. St Bartholomew’s Church, Dromcollogher, Co. Limerick: This project consisted of the sensitive renovation, restoration and extension of the existing church. The contract included the management of specialist sub-contractors. “We confirm being the lead consultants on the Market Court, Newcastle West, Co. Limerick project and we worked with the contractors Nautic Building Company Limited who took on the role of main contractor and PSCS. The project was carried out in two phases. The first phase consisted of extensive demolition works, diversion of services and enabling works including traffic control in a restricted town centre location. “We confirm that Nautic Building Company Limited were the Main Contractor on the Abbeyfeale Garda Area HQ Project, Abbeyfeale, Co. Limerick. In that capacity they proved excellent in undertaking the building of this Public project on behalf of the Office of Public Works and delivered the project on time and within budget. Since its foundation over four decades ago, Nautic has always maintained a strong philosophy of quality and efficiency. Originating in Abbeyfeale, Co. Limerick, and now based on the Dock Road, Limerick; Nautic places strong emphasis on ethical management and leadership. Nautics operational approach and our business relationships continues to centre around the precise needs of our clients. Building relationships with new clients and fostering long-term partnerships is a priority for Nautic. Working closely with design teams and project management in a consistent manner is also paramount. The experienced Nautic team is headed by Jason Quirke, Managing Director and James Quirke, Chairman. If you’d like to know more about Nautic and our services, please get in touch today. We would be delighted to hear from you.